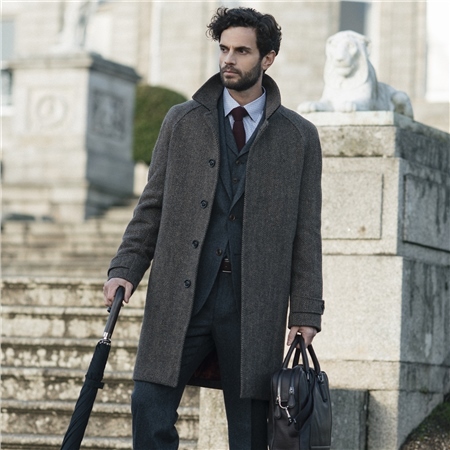 A contemporary brown and grey herringbone Donegal tweed short overcoat, featuring raglan sleeves. The fabric is designed and woven in our mill in Donegal, Ireland. A classic fitting garment, designed to be worn over a jacket or suit. Truly Made For Winter Season And What An Elegant Tweed Coat. After l got the size wrong l finally got my perfect overcoat, well done to magee again exellant service. Dressed To Impress, Hands Down, No Doubt. Thank You @ Magee. Please note sleeve and length jacket measurements are approx. to the nearest cm. Can you make a 40S version of this coat? I normally wear a 44inch jacket and I would want to wear the coat over it. What size coat should I order? Hello. Can you write, please, pit to pit, sleeve length and overall length measurements? Thank you. Hello, I recently purchased the coat and have a question. In some of the pictures, it shows that the coat has a button under one side of the collar and a strap under the other side of the collar. Are these features no longer available on the current coats? The coat I received did not have them. I was hoping to have them on my coat. Either way, it is a beautiful coat. And, fits perfectly over a suit jacket due to the previously provided sizing tips. Is this coat above knee length? Brown only or different colors too? Will you be getting more stock for size 42? Thanks. May I know the weight of the fabric (oz)? May I have the pit-to-pit and sleeve lengths for size 38 and 40? Want to be certain as I wear either a 38 or 40 depending on manufacturer.